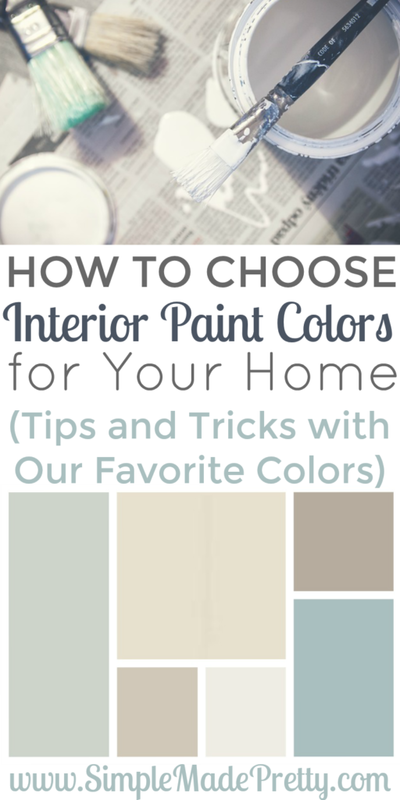 Deciding How To Choose The Right Interior Paint Colors For Your Home can be overwhelming. No one wants to spend the time, energy and money painting a room only to end up hating the color. Not to mention the many different color choices and paint type to choose from! You can’t just choose the color gray because there are thousands of shades of gray to choose from! So how do you know which colors are right for your home? I spent a month deciding on paint colors for our home so take your time deciding what’s right. 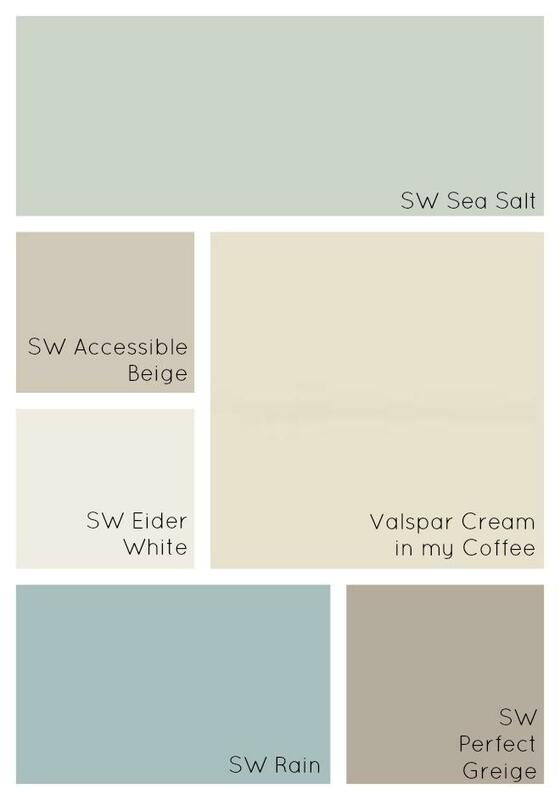 Below I share the paint colors we used in our second home (which I still love) and our third home. I also discuss the option of Peel and Stick Wallpaper (which is a popular Home Decor trend) and how we’ve incorporated Peel and Stick Wallpaper in our third home. ✅ This specific paint color is the most popular with my readers and is the best neutral paint color. It’s an excellent neutral paint color that works with furniture and home decorations in any color. In fact, in the below pictures, you will see that we’ve used it in several rooms in our home. I recommend our home paint colors to friends and family and those that ask for my help staging their home. Paint is the easiest way to transform a space so if you hate that red wall in your living room, then just paint it! Our first home had more tan/brown paint colors but it still sold in less than 2 days for the asking price so there’s proof that paint can make a huge difference in how your home looks and feels and is especially important when it comes time to sell your house. Did you know that the HGTV dream homes have all of the paint colors used listed? 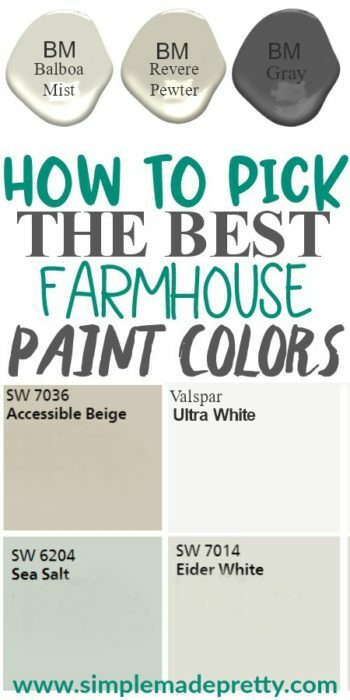 When the next HGTV Dream Home is built, keep an eye on the paint colors they used! If you plan to sell your home in the near furniture, choose neutral colors. Home buyers like a bit of color but also prefer neutrals so they don’t have to paint as soon as they move in. –>>Did you know that homes with a BLACK front door sell for more money? Of course, you can always paint your furniture (see how I transformed our furniture below using paint). Also, just because you have a red sofa doesn’t mean you should paint your living room red. Think about the undertones in your furniture (blue, yellow, etc) and match the undertones so everything flows nicely. Don’t go to the store and pick 300 color swatches… that will just make things harder! 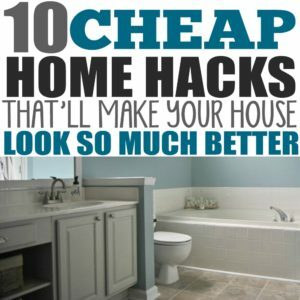 Instead, look at some of the homes that you love and research the paint colors they used. Visit a model home for inspiration and take pictures of everything that inspires you! Creating a Vision (or Inspiration) board will help you see your colors and furniture together before starting a major project (keep reading for how-to). The question I get all the time is “How many paint colors in a house Interior?” If you are painting your entire house (like we did when we bought our house) you will probably need to designate a color for every room in the house. To keep things simple, try designating 1 color for the main living spaces and 1-2 bedrooms. All of the colors that I picked were used in at least 2 rooms in our home so we didn’t have color overwhelm. I suggest to keep it under 5 total colors. Creating an inspiration board is different than a Pinterest board. I made my inspiration board by collecting my color swatches, inspirational home decor pictures, and attached everything to a physical board as the reference for our home. I was so excited to make the inspiration board that I had it on display at our housewarming party. My friends laughed that I went through the trouble of making an inspiration board, but guess what? That’s what designers do! If you’ve seen any HGTV house flipping shows, the designer always presents a visual board of some sort for the homeowner with the project colors, furniture ideas, etc. An inspiration board puts your ideas in one place so you can easily see how things will flow and work out. Write your home address at the top of the board and then just have fun attaching pictures and color swatches! Be sure to label which colors go in which room and any other notes. Now that you have some ideas on how to choose paint colors for your home, you need to make sure you have all the right supplies before you start painting. There’s nothing worse than starting a project only to find yourself running to the store to get more supplies. As long as I have these supplies on hand, I can paint a 10 x 10 space in an hour. Please note, my hubby always says I’m efficient but not accurate (meaning, I can get a lot done in an hour, but I may have missed minor details, hehe). Having the below supplies available on painting day will make the process go by faster and easier! 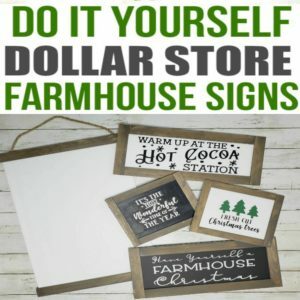 I also use these paint sticks to make Dollar Store Farmhouse Signs! Check them out here! By the way, here’s a little Paint Budgeting tip: You can get ANY name brand paint at ANY paint store… just give them the name and they will color match it. I take Benjamin Moore and Sherwin Williams paint colors to Home Depot and they make whatever color I want in the brand of paint that I choose (save some money by buying a non-name brand paint!). With all the supplies to paint like a pro, you can start picking paint colors and paint your home! Now that you have a few tips on how to choose paint colors and all the supplies you need, I’m going to share the paint colors in our home (including painted furniture and cabinets)! I’m sharing the paint colors used in our second home (purchased in 2014) AND the paint colors we are using in our third home (purchased in 2018). I’ll also discuss using Peel and Stick Wallpaper (which is a huge Home Decor trend recently) and how we’ve incorporated Peel and Stick Wallpaper in our third home. We purchased our second home in 2014 (located in Northern Virginia) and I chose the paint colors for the entire house so we could paint before we moved in. 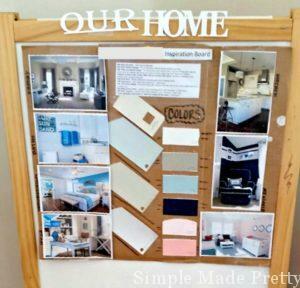 It was easy to choose the paint colors based on what I knew about the house (lighting, space, etc) and after doing an Inspiration board (see the above steps to create an inspiration board). The kitchen did not always look like this. 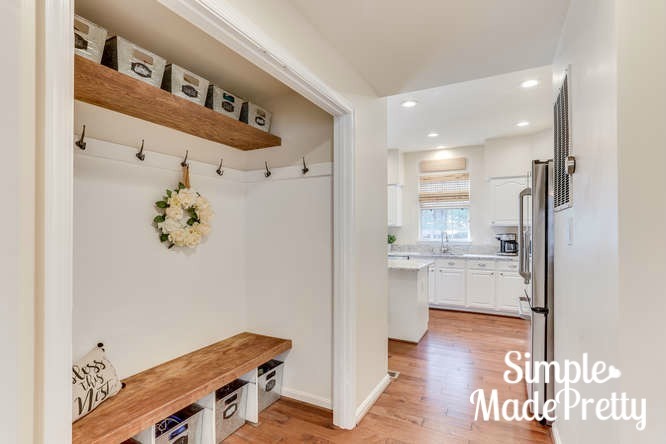 The cabinets were brown, the walls were dingy white among many other changes that we made. 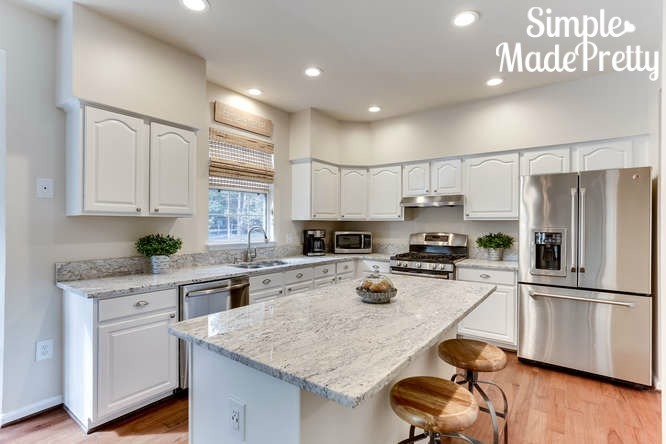 –>>You can read more about our kitchen remodel with before and after pictures HERE. Our dining room did not have a chair rail so we installed one and painted Sherwin Williams Accessible Beige above the chair rail and Sherwin Williams Eider White below the chair rail. 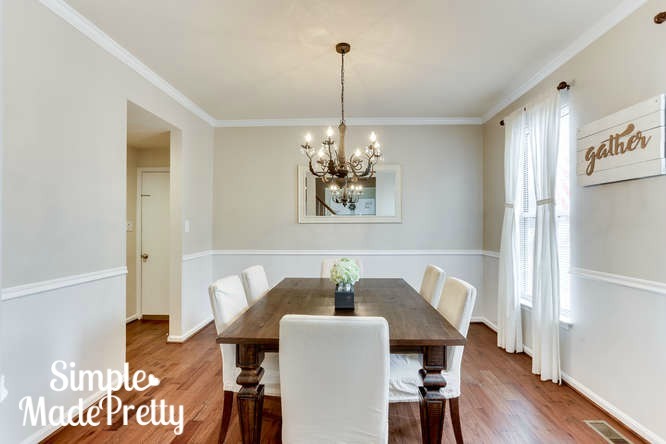 –>>See the Before and After pictures of our dining room in this post. As you can see, we have brown, white and gray furniture and these paint colors work with many neutrals. –>>You can see more Living Room before and after pictures HERE. Can you tell I like simple home decor? I believe less is more and support minimalism and cleanliness in our home and I really hate useless knick-knacks. 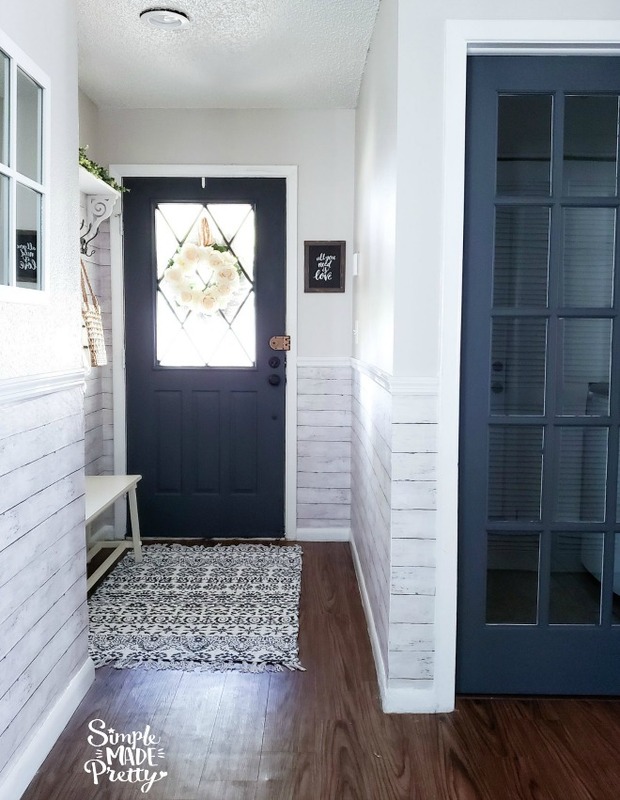 The entryway is one of my favorite colors in our house – SW Perfect Greige. It’s not gray and it’s not brown. It’s really hard to find a nice gray that is not too silvery or resembles a dark cloud, lol! 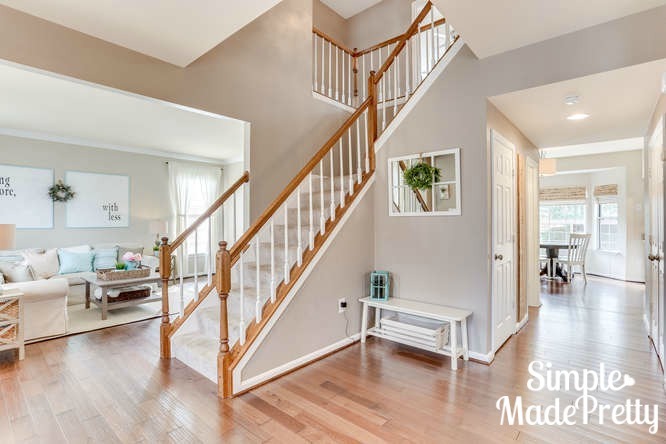 We painted Sherwin Williams Perfect Greige in the entryway, the stairwell and the hallway leading to the kitchen. The hallway also has a double-door coat closet, the door to the basement and the half-bath. There is not a lot of natural light in our entryway but this color still looks good because the flow from the living room into the entryway and then into the dining room works. It’s also a great neutral if you have brown, tan, white or gray furniture (we have all of those!). –>>You can see more Entryway before and after pictures HERE. One wall in our master bedroom is painted Sherwin Williams Rain. The other 3 walls are painted Sherwin Williams Accessible Beige (same color as the main living spaces). 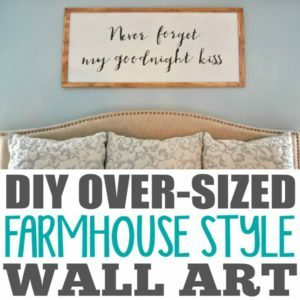 Our last house had a blue master bedroom and we wanted to keep that rustic coastal vibe. Blue is also a soothing color but I didn’t want the entire room to be blue. The master bathroom is painted Sherwin Williams Rain so the flow from the bedroom wall with SW Rain makes sense. Rain is a very blue color and looks great with white cabinets, furniture, and burlap. We painted the Master Bathroom Vanity Cabinets Sherwin Williams Repose Gray (they were dark brown) and added two shelves and molding (where there used to be an opening for a vanity stool). The kid’s bathroom is painted Sherwin Williams Sea Salt with board and batten that is painted, Behr Silky White. The bathroom cabinets are also painted, Behr Silky White. 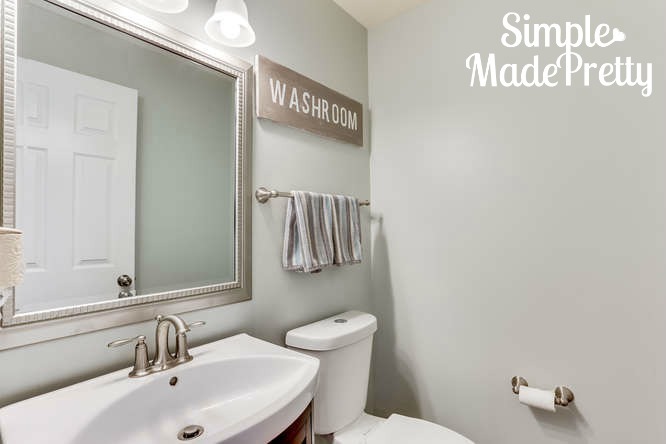 Be sure to check out this post for how we remodeled our bathroom on a budget! 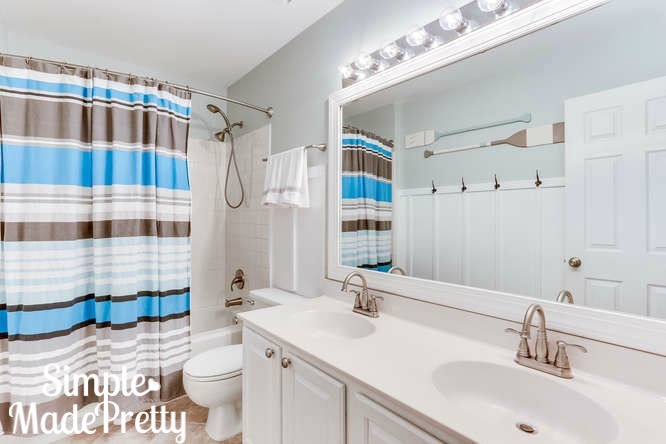 The half bath on the main floor is also painted SW Sea Salt and has a dark wood vanity so you can see SW Sea Salt is very versatile with cabinet/furniture colors. Sherwin Williams Sea Salt would look great in any room of the house if you are going for a coastal vibe. 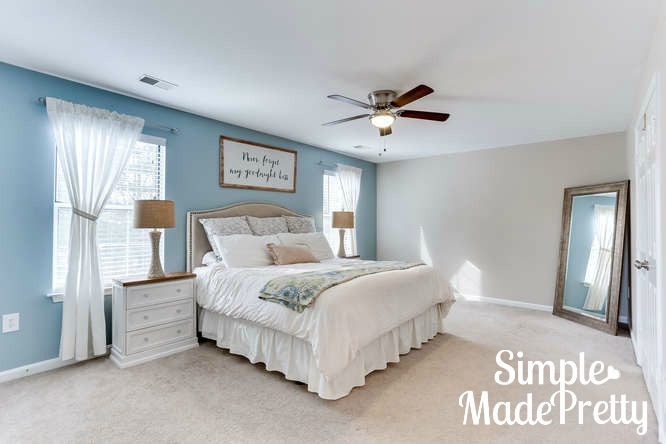 –>>See more Master Bedroom & Bathroom before and after pictures HERE. Now that you know what paint colors we used in our second home, I’m going to share the paint colors in our THIRD home (including painted furniture and cabinets)! 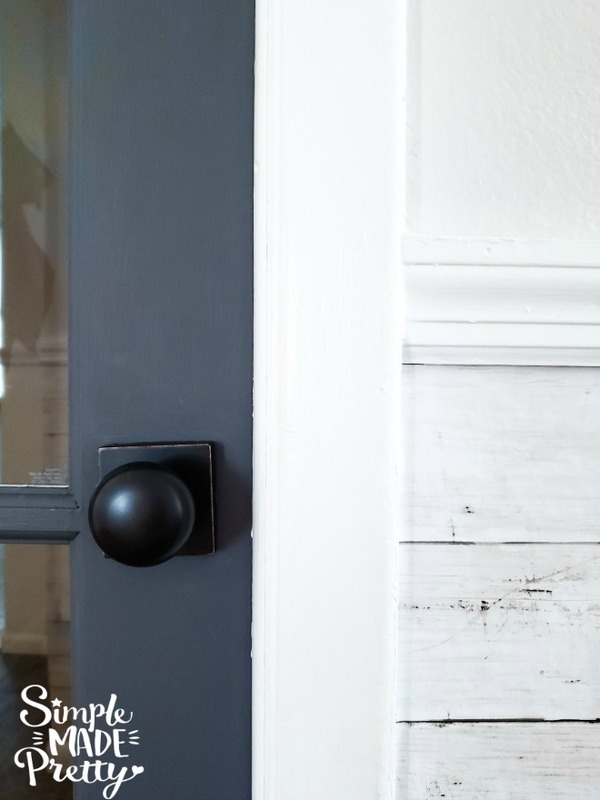 I’ll share the paint colors used in our third home (purchased in 2018) AND some of the updates we’ve completed so far. 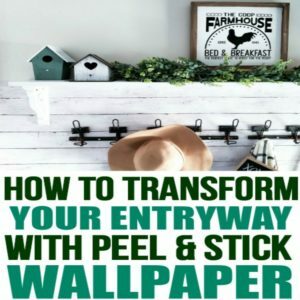 I also discuss using Peel and Stick Wallpaper (which is a popular Home Decor trend) and how we’ve incorporated Peel and Stick Wallpaper in our third home. We purchased our third home in 2018 (located in West Coast Florida) and this time, I waited to choose the paint until after we moved in. The entire house was recently painted white (every wall except the bathrooms) and I decided to leave it white for a while until I got used to the lighting in certain areas (this is a much smaller home and there are some dark corners in some rooms. The entryway doesn’t get much light, even during the day, so I painted the walls a light neutral color (Benjamin Moore Balboa Mist) above the chair rail and added this peel and stick wallpaper below the chair rail. The Doors are painted Benjamin Moore Gray in a matte paint. These paint colors worked well in our entryway because there is little light and it’s a very small space. If you have an entryway similar to ours, these paint colors and wallpaper should brighten the space! Combining the right paint color with peel and stick wallpaper can make a huge transformation in your home. Just look at our entryway and how the paint and wallpaper go together beautifully! 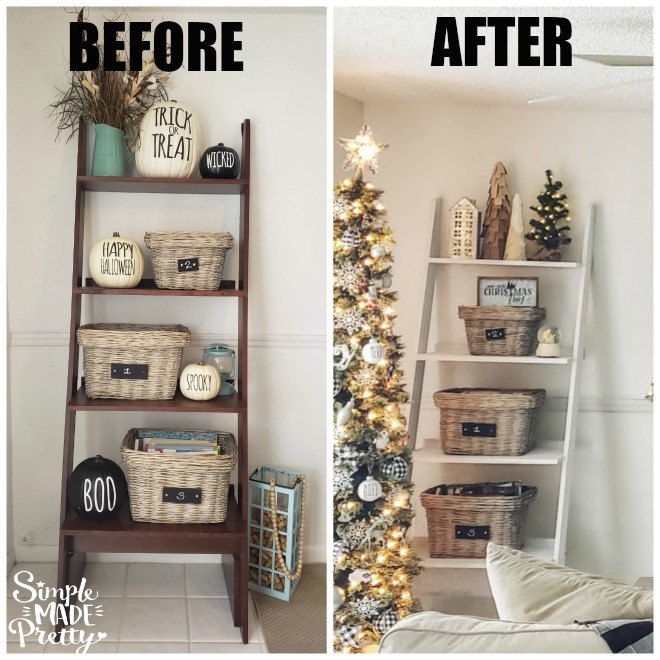 –>>See more of our Entryway before and after pictures HERE. 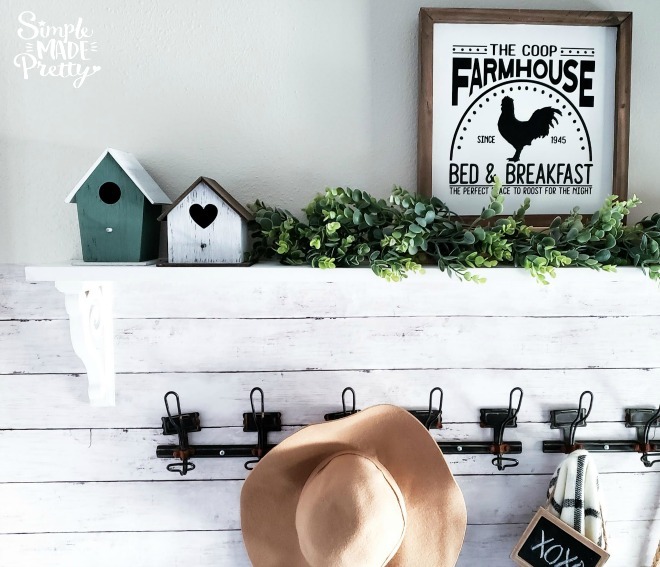 I really wanted shiplap in our kitchen breakfast nook but instead of taking the time to cut, install, and paint faux shiplap, I went with this awesome peel and stick wallpaper. In just a few hours of hanging wallpaper, I had a shiplap kitchen! The biggest transformation in our third home so far has been painting the kitchen cabinets. I’m currently working on a blog post sharing how we updated our kitchen, but for now, I will only share the paint we used on the cabinets was this paint. Our cabinets are made with a mix of materials (particle board, plywood, & Formica) and this paint worked on all of them! I also used this subway tile peel and stick wallpaper on the backsplash in our kitchen which instantly brightened the space after painting the cabinets. –>>See more of our Kitchen before and after pictures HERE. I painted the front door Behr Beachside Drive (it was a faded red color) as soon as we moved in. 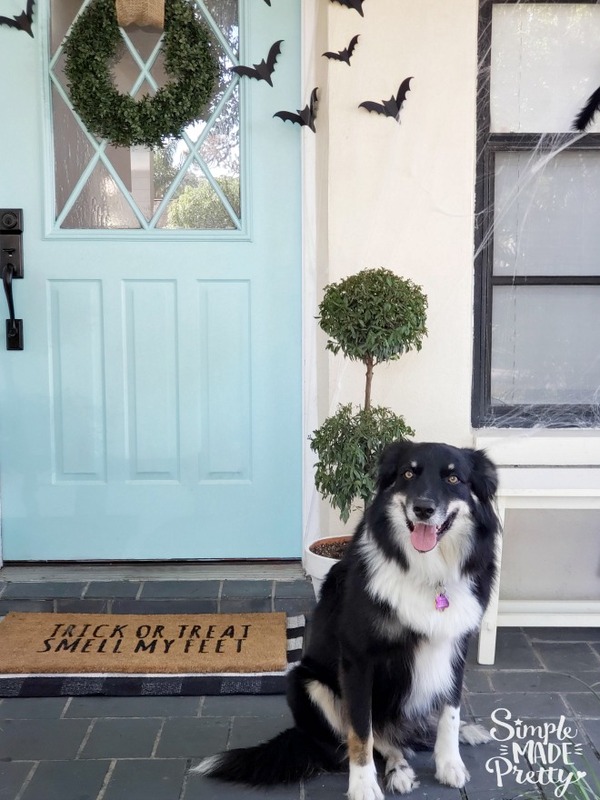 –>>You can see a Before picture of our Front Door HERE. The only other rooms that we’ve painted have been the kid’s bathroom (in SW Sea Salt) and our mudroom (Real wood shiplap painted SW Eider White). I paint a lot of our furniture, including the fabric of furniture! The reason why I paint furniture is that color trends change and sometimes I get bored with the color. Instead of spending money and buying different furniture, I try to improve what I have. 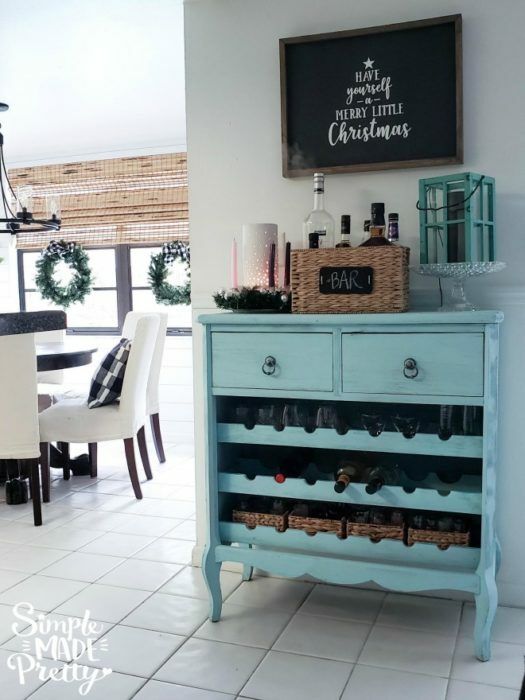 –>>My favorite paint to use on furniture is Chalked Paint because you don’t need to sand or prep the surface and Chalked paint can be used on a variety of materials (laminate included!). High-back chairs – painted with Linen Chalked paint ( U used a process to water down the paint to apply tot he fabric). 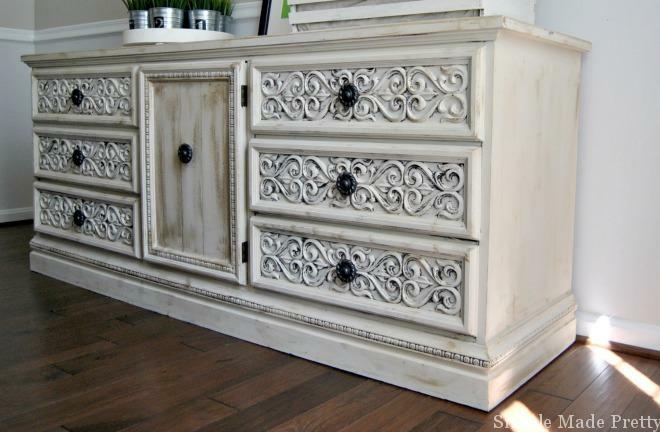 Dresser turned buffet (previously brown) – painted with Annie Sloan Chalk Paint Old Ochre. 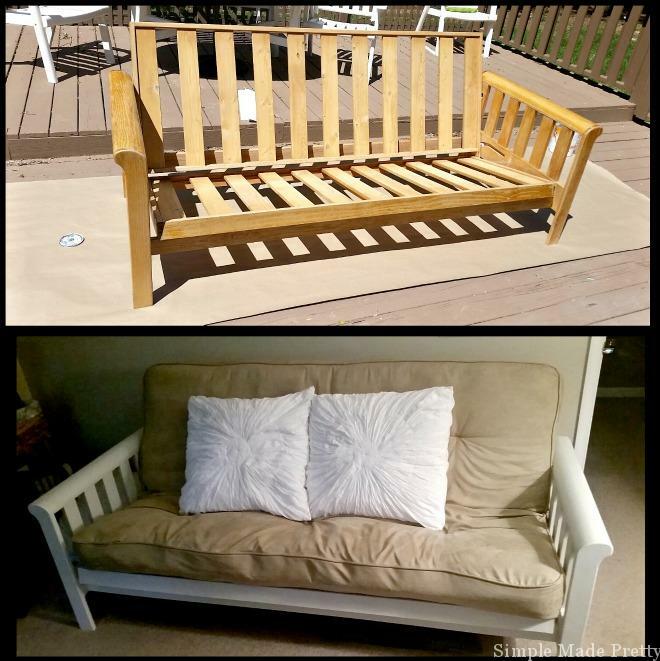 Futon frame – painted with painted with Linen Chalked paint. 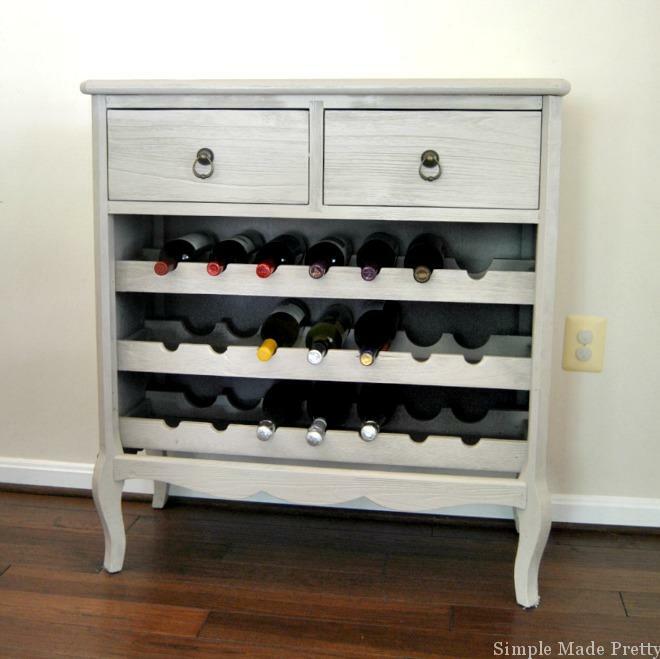 Wine dresser (previously black) – painted with SW Perfect Greige. 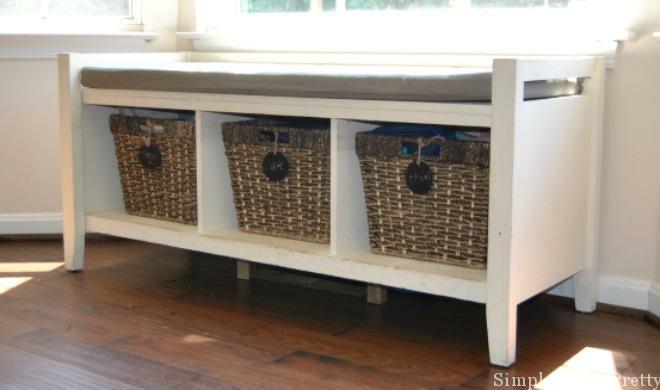 Side tables (previously brown) – painted with ASCP French Linen. 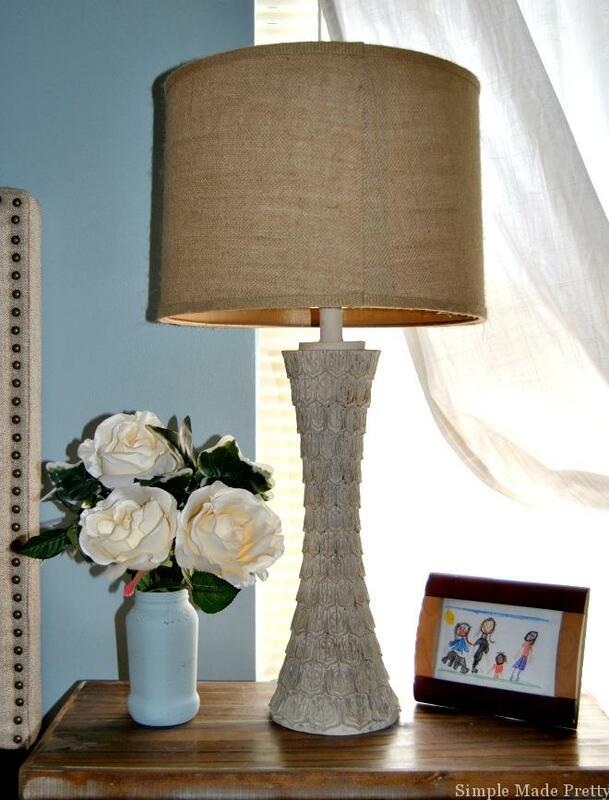 Lamps (previously brown) – painted with ASCP Old Ochre. Bench (previously brown) – painted with painted with Linen Chalked paint. I also painted this Pottery Barn ladder shelf with Linen Chalked paint. Rocking chair – painted with Behr Fuzzy Duckling. 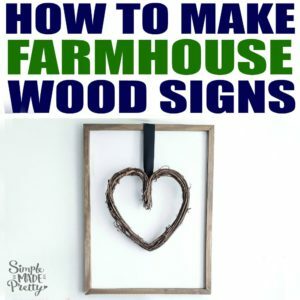 –>>I also use Chalked Paint to make my own Farmhouse signs! What is the Best Color to paint a Living Room? ✅ This specific paint color is the most popular with my readers. 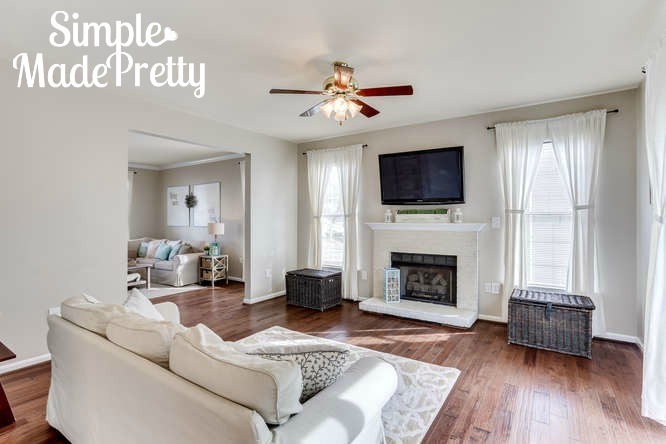 It’s a great neutral living room paint color! 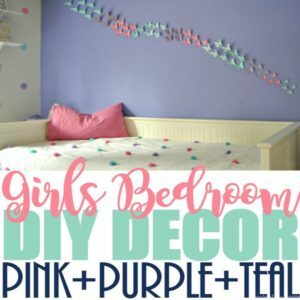 If you still need help choosing a paint color scheme for your home, check out these bedroom paint color scheme combinations to get some inspiration! Is it okay to paint the ceiling the same color as the walls? I generally stick with “no” with painting the ceiling the same color as the walls. I keep my ceilings white because it makes the room feel bigger and taller. What is the best neutral paint color? This specific paint color is the most popular color for interior walls with my readers although I painted our most recent home with this neutral paint color and I love the neutral grayish tones. How many paint colors in a house interior? If you are painting your entire house (like we did when we bought our house) you will probably need to designate a color for every room in the house. To keep things simple, try designating 1 color for the main living spaces and 1-2 bedrooms. All of the colors that I picked were used in at least 2 rooms in our home so we didn’t have color overwhelm. I suggest to keep it under 5 total colors. I have a post that can help! 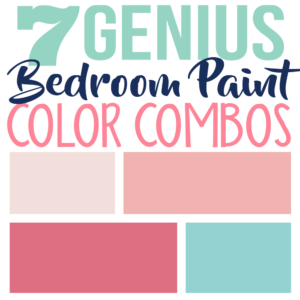 Check out these bedroom paint color scheme combinations to get some inspiration! Picking the right interior home paint colors can be frustrating but with these tips and suggestions, you can easily come up with the perfect colors for your home. For more home inspiration, be sure to Tour Our First Home here. I love all the colors you chose, but our trim is stained dark brown. I’d love to paint all that but doubt the hubs would let me do that. Do you think your colors would work? I specifically like the sea salt color. We have an open floor plan and the back splash in the kitchen is tan. Thoughts? When we built our other home about 41 years ago, we too had solid wood dark doors, paneling, and white woodwork, until we renovated about 16 years ago, we had it all painted white. What a difference, but doors are hard to keep clean, especially around the door knobs. I would suggest you paint the dark trim white. I always say, “he’ll get over it.” Worked for me. 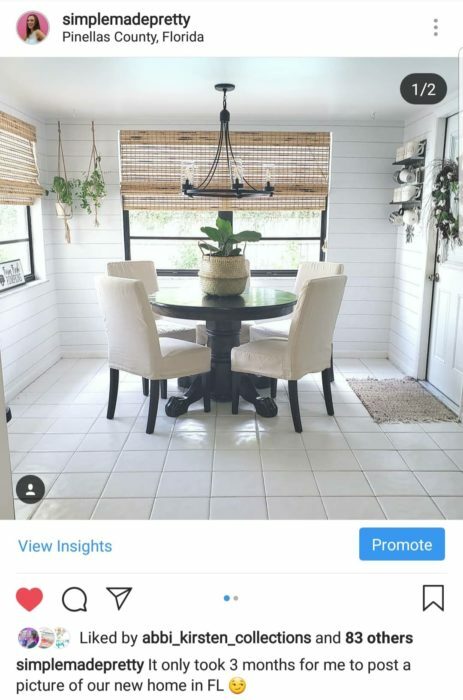 I too have just painted my kitchen 4 times, and wish I had come across your wonderful blog before I started. I’ve always felt my brown, taupe, beige, cream taste was rather dull and boring so I went totally in the opposite direction hence the 4 paint jobs, Needless to say, I am color challenged, but my 5th color of Annie Sloans French Linen went over my my kitchen cabinets beautifully, I did get intimidated by the fear of waxing so I did a second coat of an ASCP dupe. My kitchen has very little natural light and only one wall with chair rail and breadboard opposite the cabinets. I am struggling with what color I should paint that wall and the beadboard, which continues on the soffit all the way around the cabinets. I love your color pallet, and was hoping you could give me some suggestions of color that would help tie the wall and cabinets together? I would appreciate any help you can give me. Hi Ellen, Thank you for the compliments! I think you should choose a lighter color for the rest of the kitchen since your cabinets are a darker color (ASCP french linen). A nice crisp white paint would brighten things up since you don’t have a lot of light in the room. 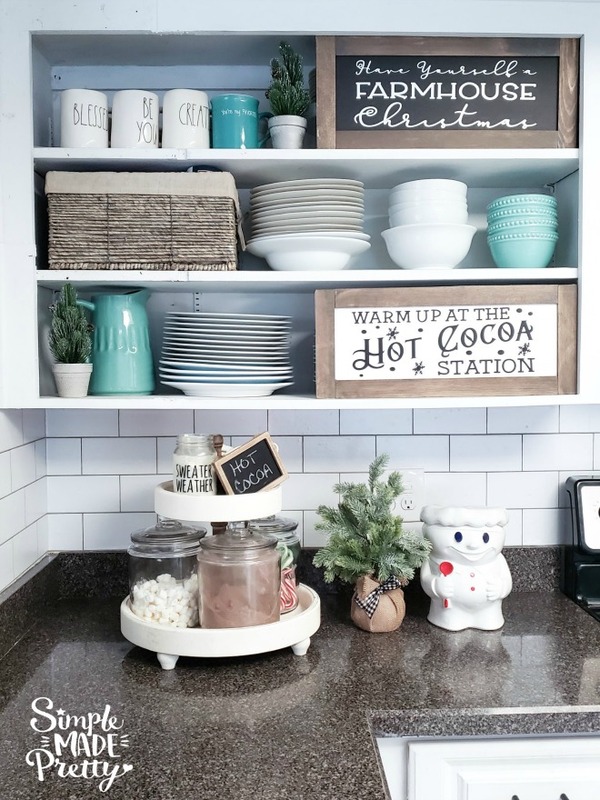 I used Behr silky white on our kitchen cabinets but you can use whatever bright white paint you may already own. I love neutrals because you can add pops of colors as seasons/holidays change and aren’t married to one particular theme. Thanks you so much for your great advice and keeping it simple! I have some Sherwin Williams Pure White, but I can purchase any white you think would look good. I have a friend that thinks I should use white on the trim, beadboard and soffit, but paint the half wall above the wall Sherwin Williams Sea Salt continuing it in to the family room. Any thoughts on that idea? I was just getting use to the all white idea when my friend offered this option. Your house colors are amazing, I just love your colors. You are too kind 🙂 Your home sounds lovely and I bet the updates make it feel new again! If you have a Sherwin Williams color in mind, just tell Home Depot and they can match the color using Behr or any other brand paint 🙂 Sea Salt is a great color and would compliment the coral and beige colors in your master. It’s subtle and soothing – perfect for the bedroom! If you want a bolder color you could do SW Rain or a Navy on one wall with the rest light beige color like SW Accessible Beige. Have fun updating the space! Hi Melanie- We’re building a new home & were struggling with paint color choices, but I think your palette is an answer to prayers! Question: We’re doing painted trim and wondered if most of your trim is all the same color, and if so, is there a SW color name? Question 2: our family room will have a more rustic Adirondack look (think wooden rocker with bear/moose cushion), so do you think the Beige/Greige would be fine with that? Hi Holly, Congrats on your new home! All of our paint trim is the same color and is an off-the-shelf trim white, I believe it’s Behr. I’ve never been a fan of painting trim anything other than white (even older homes with brown trim, I’d paint white). 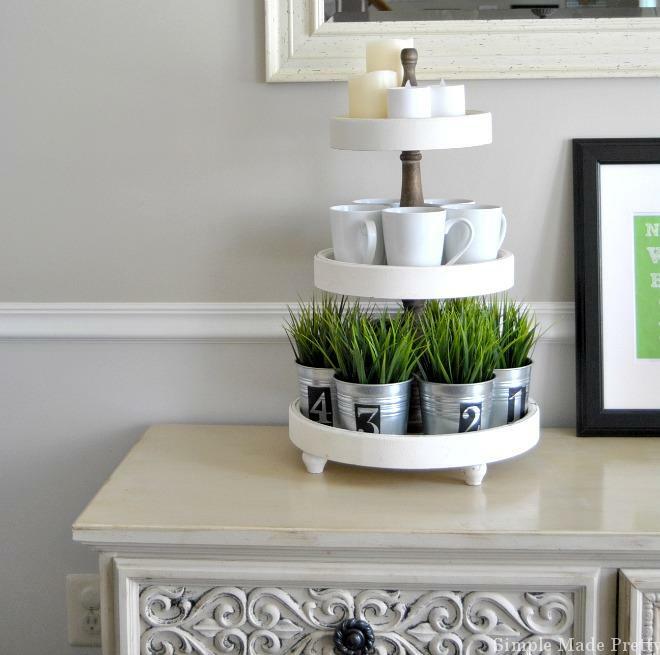 It helps to brighten your home and gives a cleaner look. 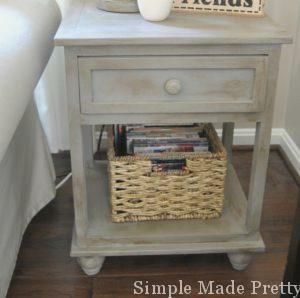 Yes, I think greige would look great with rustic furniture in your family room. Let me know if you have any other questions and enjoy your new home! I enjoyed your blog, but find myself as confused as ever! We moved onto a 20 year old house. The kitchen, breakfast nook, living room and foyer are all within sight of each other. The foyer and family room are very dark. The kitchen and breakfast nook has a bright bank of windows. All are currently a dark gray. I’m at a loss, any suggestions for a paint color that would work for all areas? Hi Patti, Since your foyer and living room are very dark, I’d stick to light paint colors. Do you like the dark gray in your kitchen? What color are the kitchen cabinets? Even with the bank of windows adding more light into the room, I’d still choose a light paint color in the kitchen. White, cream or light gray will help the space feel “clean” if you know what I mean. I have an open floor plan..living room, dining room and kitchen. The carpet is beige and my furniture is chocolate brown fabric. The walls are also beige. The kitchen cabinets are light oak. With that said, I wanted to do a bold dark brown wall until I remembered the furniture. Our home has tons of windows and natural light. Please help with color ideas. Hi Melanie, I enjoyed your blog so much! Timing of it appearing as a suggestion for me was perfect. I was struggling with colors, but I think you have helped me with that. I do have a question for you, I have two wonderful wing back chairs that I would love to keep. They are old, but the fabric is perfect, but out dated. How do you paint them? 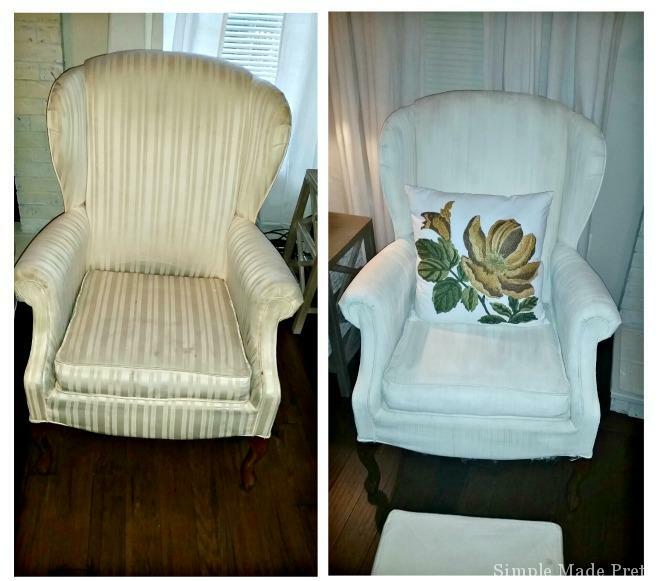 I was amazed when I saw your photo of the before and after pictures of your chairs! Please advise. Hey Deborah, Thanks so much! Here’s the tutorial I followed to paint my wing back chairs https://www.anniesloan.com/techniques/how-to-paint-fabric-with-chalk-paint. The pattern might be difficult to paint over unless you choose a dark color. My chairs were an off-white with a striped pattern that you could definitely still see the stripe after 3 coats of paint. Also, the fabric after painting feels similar to outdoor pillows/fabric, just so you know what to expect as far as the texture afterward. Good luck! Hi Melanie, Loving your home paint colors. Would love to use the SW Rain in our master bdrm but our furniture is dark brown. Do you think it would go? Also our kitchen has honey walnut cabinetry. What color would we use there? Hi Melissa, I think SW Rain and dark brown will look fine as long as you incorporate bright white somehow (all white linens, pillows, throw blankets for example). In your kitchen, I think a subtle blue or green like SW Sea Salt or SW Grassland would look nice with the honey walnut cabinets. Hi Melanie, I live in a small Florida Condo. all the walls are white. I decided to paint my kitchen orange (I love it)!! with white cabinets. I have a breakfast bar, which puts the bar chairs in the living room. I painted the wall that surrounds the bar area, Behr Creamy Mushroom. My question is I need a color for the rest of the living and dining area. Something that is lighter than the Creamy Mushroom, but, I do not want white. All my wall boards are going to be white enamel. I was contemplating painting the walls the same creamy mushroom.. But, with the shadows and lighting in my living/dining area, I am afraid it will be too dark. Hi Judy, Do you remember the name of the orange in your Kitchen? Looking for advice on a paint color to give my kitchen some color. My cabinets were painted by the previous home owner and are repose grey by SW. The floor is a light cream tile. The counters are currently a sage green, which I plan to change in the near future. I am considering using Rain by SW for the walls, but am not sure this would be a good color for a kitchen. I have used Sea Salt in my bathrooms, but am looking for some different for the kitchen. Casey, Unless you change your countertops sooner rather than later, I would stick with a neutral color or white (Eider white would look good) for the walls. The sage green counters probably already bring enough color variation/statement to the room. Once you have a neutral countertop color, then I think adding more color on the walls would look fine. A blue-ish color (like Rain or Tradewind) since repose gray has some blue undertones. Thank you so much for all of this information. I’m looking to decorate my bedroom soon and your advice will definitely come in handy and hopefully prevent any costly mistakes. By the way, your home is fab and I love the SW Sea Salt colour. Love the colors of your home! Have oak hard wood floors in all of my home except kitchen, bathroom, and bedrooms. Have dark cherry cabinets & bedroom furniture. All walls are China Doll with white trim & doors. What color laminate flooring would you suggest for bedrooms, baths and kitchen? May try some of your wall color changes also. Thanks!! I live in duplex apartment my living eara is open plan my kitchen units are white there is lots of light and the ceiling is 15ft high. Which colour would you suggest. I have cathedral ceilings in living room with taupe leather sofa loveseat. Ottoman. To liven things up I selected orange and brown sheer scarves to drape over rod.I have orange,accents throw pillows and orange vases and candles What color should I paint the wall with orange brown scarves? I LOVE SW Sea Salt! We used it in our master bedroom and have SW On the Rocks in our master bath. What color is your ceiling? We are using believable buff for main living spaces. Hi Heidi, our ceilings are 0ff-the-shelf ceiling paint white. I used chalk paint watered down (half paint, half water ratio) and applied to the fabric with a brush. I let each coat dry completely and applied several coats until the desired color was achieved. Thanks for sharing all this great information. I am challenged when it comes to color, design, etc. My entire house is honey oak cabinets, trim, etc. We have an open floor plan where the kitchen and dining room run into the great room. I love the colors you have shown. I’m trying to now remain the entire house and would like to brighten up so it’s not so depressing. Any suggestions? I have so much honey oak I think I’d like to try and tone it down since I probably can’t paint the trim at the moment. Thank you!